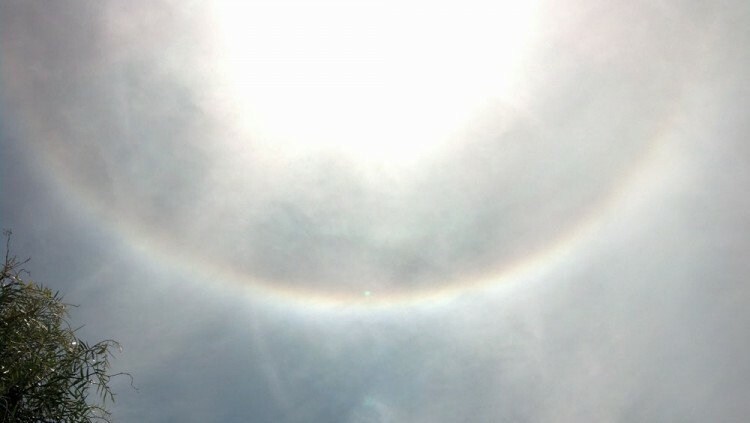 It’s almost never mentioned– mostly because it’s almost never noticed– but sun halos are usually caused by artificial clouds. That is, contrails. Those who notice artificial clouds spawned by jet aircraft (less than 1% of people by my polls) often wonder at the abundance of persistent clouds jets can produce in the sky. Different days, different wind patterns… jet clouds scatter in a variety of ways, and persist when enough cloud condensation nuclei are present, the frozen exhaust steam sticks to form clouds. In a state of nature, those condensation nuclei are water– tiny ice crystals. But today, Earth’s atmosphere contains a higher concentration of cloud condensation nuclei due to global cloud-seeding programs aiming to enhance precipitation by “modifying the weather”– seeding the atmosphere and producing a greater abundance of cloud cover. Contributing to the cloud formation is approximately 10 trillion cubic feet of water vapor produced from jet air traffic.